Rou jia mo, which translates as “meat placed between bun,” has a similar recipe to hamburgers, consisting of chopped meat inside a bun. The street food originated in Shaanxi province in the Qin Dynasty (BC 221-206), according to United States-based online news Website the Huffington Post. According to local folklore, it may even date to the Warring States Period (BC 475-221) before the Qin Dynasty. 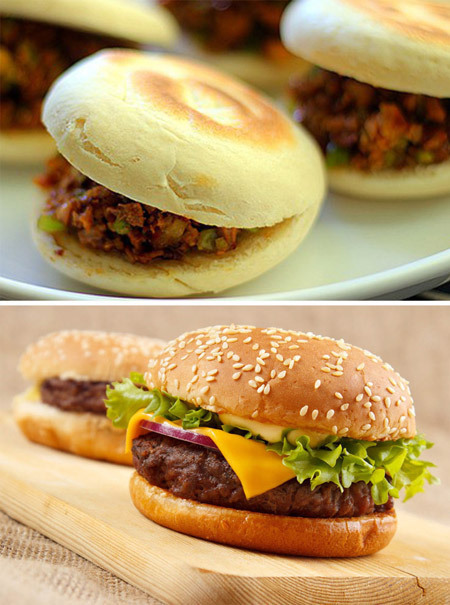 However, the earliest record of meat being sandwiched between pastry was found in documents from the Tang Dynasty (AD 618-907), according to Jia Zhigang, associate professor at the Faculty of History at Northwest University in Xi’an, capital of Shaanxi province. “The meat sandwich originated in the royal palace and then it spread among the people ... Given the celebrity effect and delicious taste, it soon became popular in the Guanzhong area (a prosperous area in Shaanxi),” Jia said. Several Chinese media outlets, including People’s Daily and China Central Television, posted translations of the Huffington Post piece about rou jia mo on Sina Weibo on Friday, receiving thousands of comments and retweets. Rou jia mo ― with the chewy bun baked in a clay oven or fried in a pan and with a mouthwatering meat filling stewed in a variety of spices ― is not only popular in China’s streets and alleys but also with foodies overseas. Xie Yunfeng, a Chinese vendor selling rou jia mo in front of Columbia University in New York, became an online sensation in 2013. Xie said he could sell more than 100 rou jia mo a day.